OurEnergyPolicy.org | Will Trump’s Plan To Bring Back Coal Jobs Work? Will Trump’s Plan To Bring Back Coal Jobs Work? Coal isn’t coming back although with real investment in carbon capture and sequestration, it could continue to contribute to a clean energy economy. In 2006, coal accounted for nearly half of all electricity in the US; by 2016, it was down to 29%. The decrease in coal by the electricity sector is because of economic reasons, as it has been outcompeted by low cost natural gas. Building new wind and utility scale solar generation is less expensive than building new coal plants, even without subsidies. States are already decarbonizing. The Clean Power Plan, the Environmental Protection Agency’s regulation to limit carbon emissions from existing power plants that was the target of President Trump’s executive action, was not scheduled to phase in until 2022 nor take full effect until 2030. Market forces, such as natural gas prices, are already reducing carbon emissions. Additionally, federal tax credits and state level policies, such as renewable portfolio standards, create market-oriented incentives to purchase wind, solar, geothermal and other renewable generation in certain states. Those factors, combined with very low electricity demand growth, have led to a 21% reduction of U.S. power sector carbon dioxide emissions nation-wide since 2005. Increased deregulation of the oil and gas sector will lead to more oil and gas production. But an increase in natural gas production is another nail in the coffin for coal. Demand has been relatively low for natural gas over the last twelve months, mostly due to a mild winter, and 2016 being the warmest year on record. As more natural gas is stored, prices will remain low and gas will continue to displace coal as the preferred fuel by utilities. All the while, more wind and solar will be built, hastening the closure of coal plants. This policy won’t work. Robert Murray, CEO of Murray Energy, the largest coal mining company in the US, told then President-elect Trump in December to “temper his expectations” when it comes to bringing back coal employment in the US. If the President wants to bring back jobs, the nation should invest in cleaner energy sources, including wind, solar, geothermal, natural gas, advanced nuclear energy, as well as carbon capture and sequestration technology for coal and gas and electric storage, to power the economy into the coming decades. What is the best federal policy for dealing with the coal industry and coal workers? 25 Responses to Will Trump’s Plan To Bring Back Coal Jobs Work? The only way to consider coal in the future is as an insurance policy. A back-up system that we know will work. We have the infrastructure in place and it should be brought up to current standards in all plants but the use of coal should decrease to the minimum level. Solar, wind, wave and tidal system are all well and good but with the exception of tidal system can be disrupted by rare geological events like volcanic eruption or other such events. WE NEED a back up plan and coal would be a perfect choice. Plants that have converted to gas should be able to have retrofit systems in place for such events. I would suggest that this be funded by the Dept. Of Homeland Security or the Dept. of Energy alone or in combination. We need coal but we are needing it less and less as time goes on. Soon it’s highest value to us will be as a fall back source. Many will wish to totally remove coal and until we get fusion or other base load technologies in place that is far too risky a play to make. It is unquestionably true that market forces (and community desire for cleaner energy) are driving coal’s market share down, and with it reducing jobs. If the market trends that were set over the past several years continue, by 2022, when the Clean Power Plan was supposed to kick in, US coal use in the power sector will have declined by 50%. So Trump’s undoing of the CPP will not bring coal power back. Indeed, some of his steps will hurt coal jobs. Not just the increase in natural gas production, one of coal’s biggest competitors, but the resumption of sweetheart deal coal leasing in the West will drive coal jobs down even faster. More federal leasing mean more subsidized federal coal, strip mined with very few workers, undermining the demand for Illinois Basin and Appalachian coal — and that’s where the mining jobs are. So Trump has actually made things worse for coal miners and their communities. But jobs were already shrinking in Appalachia because thinner, harder to work seams were driving up prices — the good coal is mostly gone in that region. And where the good coal is almost gone, no force on earth can bring back mining jobs. Even Kentucky Senator Mitch McConnell concedes that the jobs are not coming back. Step one to deal with the situation is for Congress to follow the lead of West Virginia Senator Joe Manchin and guarantee that the pensions and health care benefits of coal miners are not lost to reckless bankruptcy filings by coal companies. So far, McConnell and Trump have been silent on this. Then the US needs a new version of the original TVA — a “Coal Country Restoration Authority” which can effectively deploy the billions of dollars that have been set aside, both by coal companies and the Congress, to restore the landscapes and waterways devastated by a century of coal mining. The same skills, the same miners, and in many cases the same equipment are needed to restore coal country that were used to strip the carbon out of it — and keeping miners working doing that restoration work will give the counties effected by coal’s twilight time to build up more diverse, sustainable 21st century economic foundations. The money is actually there already — if Congress and coal companies don’t steal it. I’m continually amazed at the degree to which people seem to think the Trump administration can impact the coal sector. What sane investor would make a bet on the future of coal under a given administration with a 4-year term of office? Even aside from the competition with natural gas mentioned above, I doubt many investors, even in the coal industry, would have a high degree of confidence that this administration will be a reflection of climate policy over the next decade. The Trump Administration is a great booster for fracking natural gas. We will have more natural gas. It’s cost will become even lower, and knock out coal generation on dollars and cents. Wind and photovoltaics for smaller and more distributed generation is also competitive with new coal, and in major areas of the country where water access is critical, these technologies require no water whereas coal and nuclear require huge amounts of water. 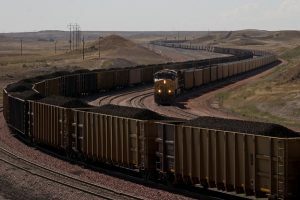 Except for exports, coal markets within the US will diminish and frankly other competitors, such as Australia, will fight and underprice to expand global markets. The eastern coal states have large biomass (trees) resources, and in some cases good wind and solar. Rotation tree harvesting are transferrable jobs, and biomass electric generation can be co-located on old coal generation sites. The removal of environmental standards by the federal government — allowing coal debris in mountain top streams which feed watersheds with heavy metals, arsenic, that contain immune suppressors and hormone disruptors — should not be tolerated. And now the States of Kentucky and West Virginia are now lowering their State standards to match. Carbon capture and storage does not resolve these pollution problems in addition to coal mining and generation’s huge water use. Coal was an important resource in its day, but makes no sense in the 21st century. In fact it makes as much sense as reviving dial phones. Give it up and move on. Natural gas is now being exported from the US and that capacity is expanding. Australia is ahead of the US in that regard and has higher total export capacity. New production needs to pull down, and has pulled down the entire world market to get gas prices down. World prices are down to $7-8/MMBTU from $12-19/MMBTU already. Considering that it costs about $3.5-4/MMBTU to chill/compress/ship LNG we are at the bottom of the cost at $3.5/MMBTU for production in the US. Not sure how to get costs to go below current production costs except new fracking/pumping technologies. Caveat:some areas are still above $8/MMBTU,but I am not knowledgeable on why. Jobs have been disappearing in the coal industry for decades, mainly thanks to automation. As noted, increasingly abundant and cheap natural gas has removed much of the market for coal. The Obama CPP never went into effect, and climate activists argued that at best it would have only minor impact. So markets much more than regulation have been the major force working against coal. Even if federal policy were to somehow make coal more attractive, jobs in the coal industry will not be coming back. So, getting to the bottom-line question, the best policy for workers and coal communities would more economic adjustment assistance — which is what should have been provided far more generously and effectively for the swath of (mostly rural) communities and people that have been stranded by the de-industrialization of the economy. I agree with the above comments about the prospects for coal. However, coal is largely being replaced by natural gas. While considerably less carbon intensive than coal, gas is still a fossil fuel. New gas plants are being built, new pipelines are being installed; potentially lots of stranded costs. How long can this go on if we are serious about climate change? Phasing out coal has been easy since we had a cheaper, cleaner, and very abundant alternative in gas. Phasing out gas will be that much more difficult. When will significant amounts of renewables and new nuclear be competitive with gas, if ever? What happens if the time when market prices for renewables and new nuclear equals that of gas is so far away that we will not be able to stay within IPCC two degrees C guidelines? Perhaps the discussion about the demise of coal should evolve into how do we get the Social Cost of Carbon built into utility planning. Even if we all agreed to phase out gas, do we have the industrial capacity to replace it as rapidly as we would like to, need to? What is your opinion. If an affordable method of making the coal utilities comply with the EPA’s Clean Power Plan were to appear, creating millions of jobs in the process, could the coal industry and the utilities combusting coal survive the American market? If coal could be combusted almost as clean as natural gas but with much less CO2 emissions, could that make a difference? Could old subsurface coal mines be sealed and used for high capacity compressed air or pumped hydro for deeper mines, fast response energy storage for renewables/nuclear buffering? Pit mines could be used for the upper water storage to drop through turbines. 1. The health, environmental, and climate impacts of of coal greatly exceed the value of the electricity produced. In other words, coal has negative social value. 2. An investment that would create one fossil fuel job would create 3 renewable energy jobs. So when you hear about a coal job being created, you should think about the two jobs that were lost. 3. I’m not sure why the government is supposed to protect the jobs of coal workers. Should the government step in now to protect the jobs of Sears’ workers losing their jobs to Amazon? But in any case, if we shut down coal and gave a $100,000 severance payment to every coal worker, the country would save an enormous amount of money over time due to reduced health, environmental (e.g., mercury), and climate impacts. Renewable jobs reflect the lower productivity of renewable vs coal and the higher cost of renewable. Renewable costs MUST include the backup power duplicate infrastructure for the 70%-85% of the time the renewables are not on or the cost of storage of the overcapacity renewable build required to supply demand all the time, without government subsidies or government created grid priority schemes that make those jobs feasible/cost effective currently. Ed: The majority of new electric generation capacity in the US in past few years was renewables. In many parts of the world without subsidies, renewables are the cheapest form of new energy. While renewables have some subsidies, fossil fuels have far higher subsidies, including the fact that fossil fuels pollute the atmosphere for free. A vast amount of renewables can be placed on the grid without a problem, as evidenced by what is happening today in Denmark, Germany, and other places. And storage solutions are dropping in price so they will also be available to help balance supply and demand in the future. Coal will continue to have a future. It just won’t be in the United States. The abundance of natural gas and its relative price will continue to take market share from coal, independent of concerns about climate change. Jesse Usubel of Rockefeller University has shown in his research that as a nation we have been decarbonizing for over 100 years and will continue to do so. Technology, economics, environmental concerns, and regulations will cause that to happen. So where is coal’s future? It is in exports to countries who find it the most economical means of heating and producing electricity. In those countries, economics and a desire for a better standard of living will ensure that until economics and perhaps environmental regulation displaces it. Bill: I assume you are using “decarbonizing” in the context of CO2 emissions per unit of GDP. While that type of decarbonization is nice, the atmosphere and climate couldn’t care less about lowering CO2 emissions per unit of GDP. In the timeframe that matters to us, all that Mother Nature cares about is the cumulative total of CO2 that we put in the atmosphere (and the extra amount that nature puts into the atmosphere in response to our emissions). And by that measure, we are doing very poorly. Atmospheric CO2 rose at a record rate the last 2 years… and about 100 times faster than the CO2 rise that ended the last ice age. As far as developing countries are concerned, fortunately renewable energy will be a better deal all around than coal. Renewables are at par or cheaper than coal in most parts of the world and because they are distributed, they reduce or eliminate the need to run wires to every town and village. This is similar to what happened when the developing world’s move to telecommunications went the mobile route rather than the old school landline approach. Coal is old school and requires a constant supply of fuel. It also harms health and the environment near where it is located and, of course, contributes to climate change. Coal should be avoided if at all possible. Actually, I was referring to Jesse Ausubel’s paper showing that the world has been moving from more intensive carbon fuels to less intensive ones http://phe.rockefeller.edu/AustinDecarbonization We are now observing a movement from coal to natural gas to generate electricity. As power plant evolution takes place, we will see more very low emission power plants come on line. Your reference to the increase in CO2 atmospheric concentrations and its implications is without context and I believe misleading. The atmosphere is composed of roughly 78% nitrogen, 21% oxygen, 0,9% argon, 0.04% Co2, and a variable amount of water vapor which is the more powerful greenhouse gas. The implication that rising CO2 levels is harmful is hard to square with it being such a small component of the atmosphere, with the fact that temperatures have been rising much slower than climate models predict, and the fact that the predicted increases in extreme weather events have not occurred. In addition, even the IPCC has reduced its lower bound estimate of climate sensitivity in recognition of these facts. While I do not disagree with your comments about the benefits of renewables where they can be installed economically in areas that have an abundance of sunlight or continuous winds. There remains, however, the challenge of storage and the fact that progress with solar and wind turbines still relies on large subsidies, which are not guaranteed to continue. 1. While natural gas is cleaner than coal from an air quality point-of-view, it is nearly as bad (if not worse) than coal from a greenhouse gas perspective over a 20-year timeframe when methane leakage is taken into account. Even without leakage, it is still half as bad as coal and much worse than renewables. If you want to do your own experiment, try eating just 50 ppm of your body weight in arsenic and see what happens. Small percentages can have big impacts! Take a look at the first graph… Jim Hansen’s 1981 prediction. temperatures have been rising significantly faster than he predicted then. 4. You have previously brought up the point before that the IPCC lowered the lower bound for climate sensitivity. As I pointed out then, they did not lower the mid-range value and recent studies show that the climate sensitivity may be higher than the mid-range because climate sensitivity is higher in a warmer world than a cooler (ice age world). In any case, to protect our children, it would be imprudent to assume a low figure. 5. Yes, coal has been an important energy source in the past and it also has been a primary contributor to climate change and has caused enormous health and environmental impacts. Asia is certainly increasing all forms of energy, but it looks like China is backing off from coal because of the terrible health impacts it has caused (killing millions of people a year in China alone) as well as the climate impacts. The other reason renewables work in developing countries is that they currently have nothing, so they can easily deal with intermittent power, as it is still an improvement over nothing, including for education. But, to fully join the industrial society the developing countries will need reliable full time power, not intermittent. Industry can’t work on intermittent nor can full quality education. It is economically questionable to start down a road that needs to be replaced or needs higher average cost added for storage to such a renewable based system. I. E. Is renewable penny wise, but pound foolish in developing countries. Just a profit for energy companies, vs in the best interest plot the people. Ed: Developing countries with baseload power, like India, do not necessarily offer reliable energy. In those parts of the world (and even in our part of the world) renewables can offer reliable power… often more reliably than “baseload” supplies. Burt Richter and I expressed our views in an op-ed, ” President Trump’s Futile Plan to Restore Coal-Mining Jobs,” that appeared in the San Francisco Chronicle last week. The title speaks for itself. The link to the essay is http://www.sfchronicle.com/opinion/openforum/article/President-Trump-s-futile-plan-to-restore-11047454.php. Construction of new coal-fired power plants is falling worldwide, led by cutbacks in China and India. Construction starts for coal-fired plants in China and India were down by 62 percent in January from a year earlier while new facilities starting operations declined 29 percent, according to Paul Fisher, an economist at Cambridge University’s Institute for Sustainable Leadership. I would also challenge the statement that “progress with solar and wind turbines still relies on large subsidies, which are not guaranteed to continue.” That too is no longer true. Lazard’s Unsubsidized Levelized Cost of Energy Comparison in December showed wind to actually be the cheapest resource, cheaper than gas combined cycle. Utility scale solar is in the running in areas where it handily beats gas and diesel-fired peaking plants and can cost as little as $46 per megawatt-hour to produce. Lazard’s unsubsidized list: wind, $32; nuclear, $97; coal, $60; gas plants, $48.” And according to Moody’s, in the Great Plains states, the average cost of wind power has fallen to around $20/MWh. These prices no longer rely on large subsidies and we need to acknowledge that fossil subsidies remain in addition to offloaded health and environmental costs. Tesla is beginning to deploy large battery systems. The company is providing the batteries for the build-out of Advanced Microgrid Solutions’ recently financed 50 MW installation. And the company recently began operation of an 80 MWh installation for Southern California Edison. Finally, acknowledging pollution represents a paradigm changing. Two-thirds of all airborne mercury is from the smokestacks of coal-fired power plants. “Last month, for the first time in about 15 years, Kentucky changed its fish consumption advisories. There are high levels of mercury in most of the commonwealth’s lakes and rivers. The grid and the resources used to generate electricity are beginning a dramatic change. “Reducing the amount of electricity that needs to be generated by traditional power plants, transmitted long distances, and distributed locally, reduces the overall cost and environmental impact of our energy system. … The efforts in New York, California, and Texas are on the right track.” That’s not just clean, it’s smart. 1) The relative cost competitiveness of wind/solar is highly location dependent. To say wind or solar is cost-competitive is incomplete. 2) LCOE isn’t necessarily the best point of comparison, because consumers (us) demand both energy AND capacity. As a result, comparing non-dispatchable renewables to dispatchable fossil fuel resources is a bit of an apples to oranges scenario. A fairer comparison would incorporate integration/storage costs for wind and solar, and even this wouldn’t be a true comparison since recharging the storage system isn’t entirely controllable either (similar to hydroelectric generation). 3) When publicly traded companies that produce renewable energy products discuss their biggest risks in their annual reports, the potential end of subsidies is often cited…which gives a pretty strong indication that incentives are needed to continue to support renewables development. All that said, I think the discussion here is quite clear that Trump can’t do much about coal; that the costs of coal are often underappreciated (with regard to health in addition to carbon emissions); that we continue to need a plan to wean off of natural gas; and that forward thinking governments can do much to accelerate such things. I think a particularly exciting challenge at present is that of modeling all of the economic costs and benefits of distributed energy resources, and providing a policy structure that allows those costs to be applied and benefits to be reaped. NY seems to be leading the way here, but it will be exciting to see what else comes out of it. President Trump is making things happen. There are Clean Coal technologies waiting to be into place. Carbon Capture Utilization System technologies will remove over 90% of the CO2 out of the combusted coal exhaust and transform the CO2 into useful-saleable products. Millions of new full time jobs will be created in many sectors supporting these technologies. Combusted coal will put into the atmosphere less CO2 than a natural gas power plant. My friend, I have worked on carbon capture systems for coal. The whole thing makes absolutely no economic sense and no investor will ever fund it. Mr. Trump is full of deep doo-doo (or if you prefer) caca. There is no carbon capture. The only hope for coal is to find a spiffy way to re-arrange the molecule. Since the only thing we got these days is reformers, I would say that there is nothing to do with coal, except leave it in the ground — where it belongs. Bill: While there have not been any low-cost carbon capture systems to date, they are on the horizon. One of our companies, Inventys, has a pilot running in the field today that is a fraction of the size and cost of traditional solvent-based capture systems. When available commercially in a few years, I don’t expect these capture systems to be used for new fossil-based power plants since renewables will be cheaper even ignoring the cost of capture. However, there will still be thousands of fossil power plants, cement plants, steel mills, and other industrial sources that will need carbon capture if we are going to try to preserve a livable climate for our children.